Various media await the arrival of President Donald Trump at Mandan Refinery. 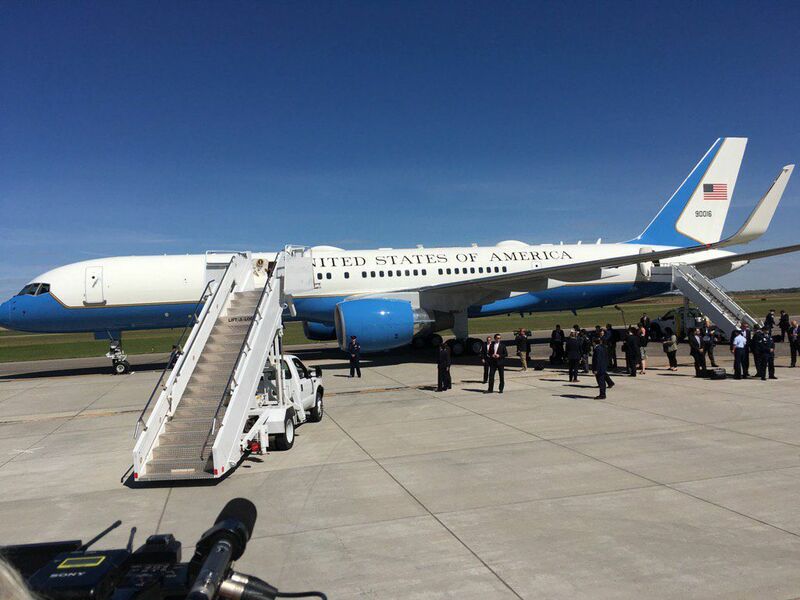 Air Force One landed at the Bismarck airport at about 2:35 p.m.
A secure area for supporters, including military families, was created on the tarmac of the Bismarck Municipal Airport. Hundreds gather at Mandan Refinery to await the arrival of President Donald Trump. Marty Beard, from south of Bismarck, was outside the Andeavor Mandan Refinery early on Wednesday waiting for the arrival of the presidential motorcade. Beard said the message he wanted to get across to any protesters was "if you don't love this country then leave." President Donald Trump's opening remarks, which began at about 3:25 p.m., addressed natural disasters, including the drought in North Dakota and the impending Hurricane Irma. He quickly moved into the main topic, tax reform, saying that tax cuts and reform are needed to "make America grow and create more jobs for Americans." Once the speech was underway, the gates to the refinery were closed and traffic was reopened. Many of those lined up outside of the refinery, watched the speech on their smart phones. Trump referred to the state as a "North Dakota energy miracle." "This state is a reminder of what happens when we promote American jobs," said Trump, later adding: "Washington policies have pushed American industries offshore." He also spoke to simplifying the tax code. "Our tax code has gotten ridiculously complex," he said. "Our plan will provide tax relief to businesses of all sizes." The speech lasted 39 minutes. He was en route to the Bismarck Municipal Airport by 4:20 p.m.
Trump and his entourage, including the North Dakota delegation, Energy Secretary Rick Perry, Environmental Protection Agency Administrator Scott Pruitt, Interior Secretary Ryan Zinke and Treasury Secretary Steven Mnuchin, arrived at the Mandan Refinery at about 3:10 p.m., after crossing the Bismarck Expressway Bridge at about 3:05 p.m.
Police, citing safety concerns, asked protesters to stay off the bridge, and they dispersed to either side of it. Traffic remains congested along Bismarck Expressway. The president landed at Bismarck Municipal Airport at about 2:35 p.m. today — about 15 minutes behind schedule. Trump was slated to talk at Mandan Refinery, where about 700 guests awaited, on tax reform. As a helicopter was flying overhead, many notable attendees awaited the president's arrival. Among those invited were University of Mary administrators Jerome Richter and Brenda Nagel. Scott Meske, president of the Bismarck Mandan Chamber of Commerce, was also on hand. Mandan businessman Shane Hafner was there to hear Trump's speech. State Insurance Commissioner Jon Godfread was in attendance, and Public Service Commissioner Julie Fedorchak brought her daughter, Elizabeth. By 3 p.m., the crowd outside the refinery provided a mix of supporters, whose signs spoke to coal, immigration and shared anti-Hillary sentiments. Protesters' signs offered up DAPL, tax law and Red Fawn Fallis commentary. Verbal clashes erupted over such topics as Trump's treatment of women and DACA, an immigration policy known as Deferred for Childhood Arrivals. A large sign, "Without diversity, we'd only have lutefisk," stood out along the street. At 2:30 p.m., Craig Cobb, a noted white supremacist, was spotted among the crowd gathered outside the refinery. "Mr. Trump has done a lot for the country," he said. At 2:20 p.m., Gov. Doug Burgum, North Dakota's first lady and Lt. Gov. Brent Sanford arrived at the Bismarck airport. At 1:50 p.m., Trump's motorcade, ready to take him to Mandan, arrived at the airport. Supporters and protesters gathered hours earlier to stake out spots outside the refinery, at the airport and along the anticipated route of the presidential motorcade. 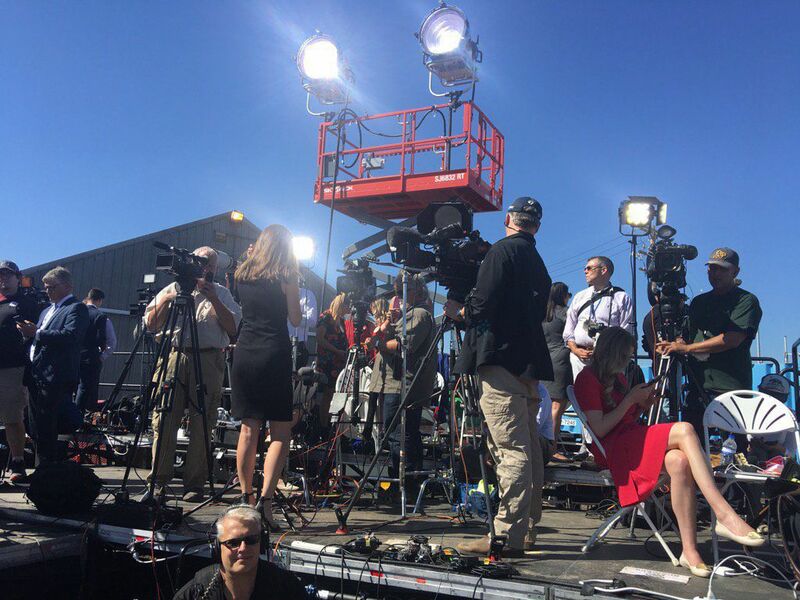 A secure area for supporters, including military families and members of Sen. John Hoeven's family, was created on the airport's tarmac. By 1:30 p.m., hundreds of invited guests, including oil billionaire Harold Hamm, had gathered at Mandan Refinery.